Stylomastoid artery arises from the posterior auricular artery. It originates from a large superficial trunk which circulates the occipital artery zone in around 50% of occurrences and it originates straight from the distal external carotid artery into the remaining 50% of occurences. • The stylomastoid artery travels via the stylomastoid foramen and origins within the facial canal, where it rapidly supplies divisions towards the chorda tympani. • It carries onwards till it connects as well as anastomoses with the collateral facial nerve of the petrosal branch of the middle meningeal artery. • An arterial arcade is created as a result inside the facial canal. 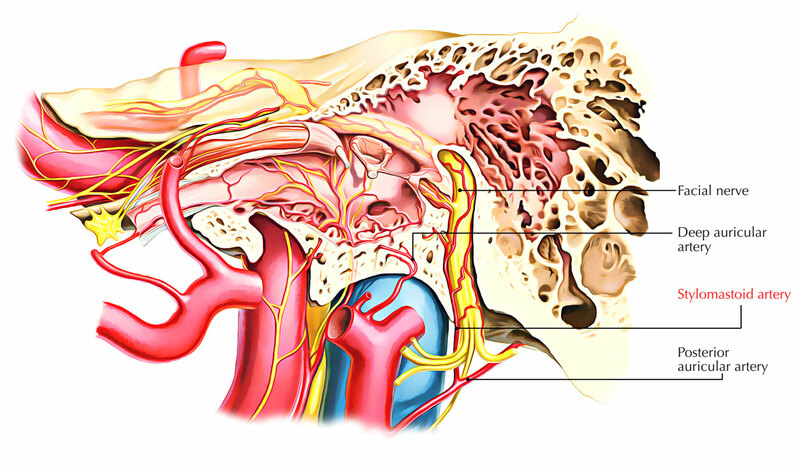 The arcade of the facial nerve is easy to identify. It meets at a right angle superiorly and posteriorly towards the radiolucency of the external auditory canal.